Canning fruits and vegetables runs in my veins, though it took me many years to admit it. My paternal grandmother had an area in the basement where she kept all of her home-canned goods, including pickles, green beans, apple butter, tomatoes, tomato juice, jams, and jellies. My mother canned vegetables, jams, and jellies practically every year when I was growing up. Dad brought home bushels of string beans, spread out an old sheet and dumped the beans on top, and then we’d spend a morning or afternoon stringing and snapping the beans for mom to can. I didn’t think it was very fun and I swore to myself that I would never do any canning when I grew up. Well, many jars of jams, jellies, and salsas later, I have to say that’s one promise I couldn’t keep; the lure of making my own was just too strong. Five years ago I bought the Ball Blue Book (the older version) and some equipment at my local discount store and off I went. My sister had also said that she would never do any canning, although she caved sooner than I did. She has all the gear for acid and low-acid canning, and even had a stove in the basement of her last house that she used strictly for canning. Canning is hot work and the cool basement made it more bearable. You don’t need a huge space for canning, although having at least a little counterspace helps. The last house we lived in was a small, craftsman bungalow with a kitchen that Michael referred to as the “space shuttle kitchen.” It was the smallest kitchen I had ever worked in, even smaller than the tiny kitchens I had overseas. And despite having a counterspace that was only 18 inches by 24 inches, I was able to do some summer and fall canning. Consider this post a canning primer, a very brief summary of the basics of boiling water canning. For health reasons you should NOT rely solely on this summary. (LEGAL DISCLAIMER: Remember, I am not a cooking professional.) I highly recommend checking out some of the authoritative sites and books in the Resource list below and purchasing some basic canning supplies to help you safely enjoy your canning experience. Acid foods can be processed in a boiling-water canner. Acid foods include fruits and tomatoes, though tomatoes will require a little extra acid from citric acid, vinegar, or lemon juice. 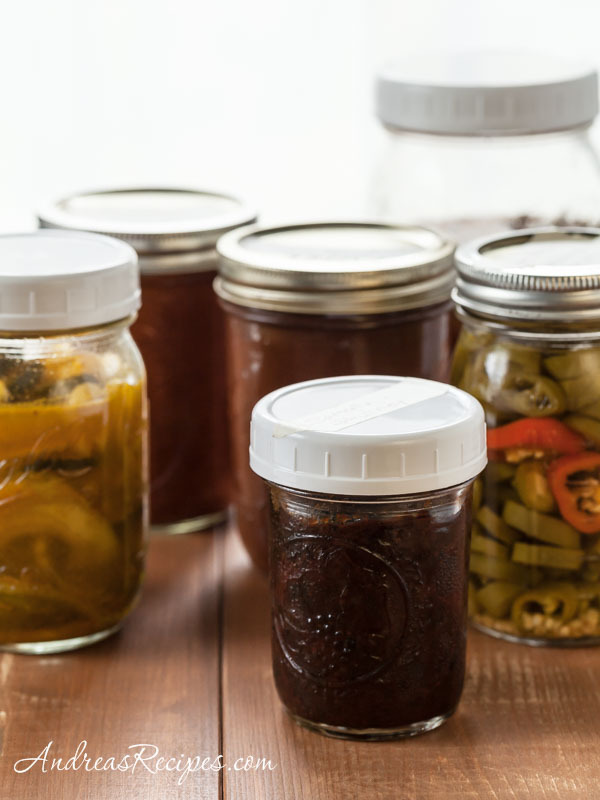 Always use a recipe specifically designed for canning. If the recipe does not state that it is designed for canning, then beware. If the recipe does not have enough acid, you could run into nasty contamination problems. Some of these sound silly (lid wand? ), but I found it very helpful. It’s basically a long handle with a magnet embedded in one end that allows you to easily remove the metal lids and bands from the hot water. You can find a canning tool kit for around ten dollars or so that includes the lifter, funnel, spatula, and lid wand. I found mine in a discount department store. You may also find complete kits that contain the canner, rack, and all the smaller pieces. Jars are always sold separately. Check your equipment carefully to make sure that the jars are not chipped or cracked, and that the lids and bands are not warped. Always start with clean equipment so that you don’t introduce unpleasant microorganisms into your preserves. Wash your jars, bands, and lids in hot, soapy water. Rinse thoroughly in hot water. You may also run them through the dishwasher. For hot pack foods, jars must be heated prior to packing to prevent breakage due to temperature shock. Submerge the jars in just enough water to cover and bring to a boil. Turn the heat off and leave the jars in for at least 10 minutes. If you are making jelly or any other product that is processed for less than 10 minutes, you must sterilize the jars instead of just heating. Place the jars in a large saucepot and cover with water. The jars must be totally submerged. Bring the water to a boil and allow to boil for at least 10 minutes. Add an additional minute for every 1,000 feet above sea level. Leave the jars in the hot water until you are ready to use them. I used to heat the lids per the instructions in the book, but according to Ball® it is no longer required. Filling jars: Depending on the recipe, you may either hot pack or raw pack the food. Jams, jellies, salsas, and sauces are hot packed. Foods that would be delicate after cooking, such as peaches, are generally raw packed. Headspace: Always follow the instructions in your recipe for headspace, usually 1/4 to 1/2 inch for acid foods, jams, jellies, pickles, and relishes. If you have too little headspace, the food can expand into the lid preventing it from sealing. If you have too much headspace, the jar may not seal because the processing time won’t be long enough. Air bubbles: Once the food is packed into the jars, you must remove any air bubbles in the jar. Run a nonmetal spatula around the jar between the food and the side of the jar. Do not use metal utensils as these can scratch the hot jars and potentially lead to breakage. Clean jar rims: Wipe the rim of the jar with a clean, damp cloth. No food particles should remain on the jar rim, as that can prevent the lid from sealing. Lids: Place the lid on the jar with the sealing compound next to the glass. Screw a band over the lid just until it is finger tight. DO NOT USE FORCE. Your jars should now be ready for processing. Always process food immediately after it is packed and the lids and bands have been adjusted. This is important for preventing microorganisms from entering the jars and maintaining the correct temperature for processing. Processing time: The time will always vary depending on the type of food being canned, the method of packing food into the jars, and the jar size. Check your recipe for the correct processing information. 1. Fill boiling-water canner half full with water. Heat water to a 180° F.
2. Place the canner rack above hot water in the canner. 3. Using the jar lifter, place filled jars onto rack immediately after each jar is filled. 4. After all filled jars are placed on the racks, carefully lower it into the water. The water level must cover the jars and caps by 1 to 2 inches. Add more boiling water if necessary (NOT hot tap water). 5. Put the canner lid in place. 6. Adjust heat to medium-high, bringing the water back up to a hard rolling boil. Reduce heat to maintain a gentle rolling boil throughout the processing period. 7. Set time for the number of minutes required for processing. 8. After the processing period is complete, turn off the heat and remove the canner lid. 9. Using the jar lifter, remove the jars from the canner and set them on a towel to cool. Leave 1 to 2 inches of space between the jars. 10. Allow jars to cool naturally for 12 to 24 hours before checking for a seal. Do not retighten the bands. DO NOT invert the jars, cover them with a cloth or try to cool them quickly. After the jars have cooled for 12 to 24 hours, test the lids to make sure a vacuum seal has formed. Press the center of the lid to make sure it is concave; then remove the band and try to lift the lid off with your fingertips. Other methods for checking are not as reliable. If the lid does not seal within 24 hours, the food must be reprocessed or stored in the refrigerator and used within a few days. Wipe off the lids and jars to remove any food residue. Label each jar with the date, type, and variety of the product. Store food between 50° and 70° F in a dark place, and use within one year. Do you still need to boil string beans for 20 minutes before you eat your home canned beans? I just took a 3-hour course on canning at the Institute of Culinary education because I have always been intrigued by canning but afraid of killing someone in the process! It’s a little daunting but very fun once you understand what the to dos and not to dos are. What you’ve written is a great summary. Do you have any favorite recipes to share? Hi Debbie: I’m not an expert with low-acid canning, but I’ve never heard of a requirement for boiling canned string beans before eating them. According to my mom, the family’s low-acid canning expert, the beans are cooked before you can them, so boiling should not be necessary. All you have to do is warm them up. Now if concerns about harmful bacteria prompt you to consider boiling them, I say just throw out any batch that has developed a foam inside the can or if the lid unseals or swells. Botulism just isn’t worth it. Hi S: I’ve posted my favorite recipe for sweet red pepper jelly, but that’s it so far. Thought you’d be interested to know I just linked to you from my most recent post (Apricot Jam). Hi S: Your recipe sounds tasty! Thanks for the link. Hello, I was wondering why everyone is afraid of water bath and green beans, I grew up watching it done my whole life, the things I have read so far is they don’t hot bathe them long enough nor do they pack them tight in the jar. Nice info. By the way, do you know why metal utensils shouldn’t be used in preparing jams? Ive canned tomatoes for years and many moons ago I stopped the “dip in hot water to remove skin” step. Just chop and put in jar and process. Ive found that the skins turn into teeny tiny curls during the processing and do not detract from any recipe. Saves hours of hot burned fingers, wet sloppy monkeying around in the kitchen. Literally cuts canning time in half and you need a microscope to see them in the jars and meals. As for meat products, pressure canner only! Ive canned goat, beef tongue, pork tenderloin, hamburger and chicken. The chicken came out rubbery so never again for that but the rest is the finest flavored last for years quick meal makers. Be bold! do you have a receipe for canning goat? We just got a couple and would like to butcher the wether and can/freeze the meat. We found lots of eating receipes, but none on canning. Hi Sheryl. I’m afraid I don’t have any experience with canning meat, but I do know you need a pressure canner for the job. You can read about canning meats at the National Center for Home Food Preservation. You have a very useful site. The information will benefit a lot of newbies for canning acid vegetables. Keep up the good work. Hi Rose. Green beans do not have enough natural acid and therefore should only be canned with a pressure canner. Good luck! I have been canning green beans with the boiling water bath method for a few years now and have had no problem. In fact I have never even used a pressure canner. I also have canned green beans with the boiling water bath method. But it has been years since I have done it and cannot remember how long to keep quart jars in the boiling water. Can you help? Hi Sharon. I realize that many people can green beans with the boiling water method, but I believe it is unsafe because research has shown that the bacteria that causes botulism survives even lengthy times in a boiling water canner because the temperature just doesn’t get high enough. I highly recommend the National Center for Home Food Preservation website for information on canning green beans and other fruits and vegetables. Hi, I too have never ever used a pressure canner, and am going to can some beans, I am wondering, do you cook the beans first, then place the hot beans in hot sterilized jars, the put them in the water bath for a few minutes, or put them in raew, or just blanch, and put them in the water bath. How much salt do you put in, as well, if any. I look forward to hearing your reply, thanks in advance. Hi Donna. Basic instructions are in the blog post above. You can also find more information on the websites mentioned. Good luck! Hi Jean. The National Center for Home Food Preservation has instructions for canning both white and sweet potatoes in their section on canning vegetables. Because potatoes are not acid foods, you should use a pressure canner and follow the NCHFP instructions carefully to prevent problems with unpleasant microorganisms in the food. Good luck! Hi Brad. My first instinct was to say yes, but I needed to consult some of my resources to be certain. The Ball Complete Book of Home Preserving has several recipes for canning homemade mustard and a hot pickle mix (that is probably close to your giardiniera) using the boiling water method, so it is possible. The trick is getting the correct minimum level of acid (vinegar) uniformly throughout the final product to keep it them safely shelf stable and prevent the growth of botulism. Giardiniera are a type of pickle, so you may want to read up on pickling at the National Center for Home Food Preservation website for some tips. I am canning pickled banana peppers and after the jars cooled down I noticed the water level dropped below the top of the peppers, the lids are sealed will this be ok? I, like Norma, have been canning beans in the hot water bath for years (28) & have never precooked the beans. No one has even got sick. If a jar doesn’t look right when I open it, such as milky juice or mushy beans, I simply throw it out. This rarely happens. I do not own or wish to use a pressure camber, I know someone who got severely burned so am terrified to use one. I’ve also canned duck, goose & chicken in the same manner as the vegetables and have never had a jar go bad. Different vegetables will require different times; some older cookbooks provide them. As well, the beans keep better if you use glass lids & rubber rings rather than snap lids. So do pickled carrots as the vinegar eats away at the lids over time. i just canned my first batch of dilly beans please wish me luck. thanks for the post. i have never canned any thing but garbage LOL but your post was helpful and it helped me go forth in confidence THANKYOU!!! I actually pickle my green beans before I can them. The recipe is simple and you can use the hot water bath when canning them. Pack jars with raw green beans. Add 1 tsp dill seed and 1 garlic clove to each jar. (I also add diced onion but personal preference). Bring water, vinegar, sugar and canning salt to a boil. Fill jars to within 1/2 inch from top. Place hot lid on clean rim. Place ring on jar. Finger tight ONLY! Place jars into hot water bath. Make sure jars are submerged with 1 to 2 inches of hot water over the top. Bring water to a rolling boil and boil for 10 minutes. Remove jars to cutting boards to cool. Check seals after 12 to 24 hours. My grandmother canned green beans like this for years. Its the only safe way I know without a pressure canner. Thank you so much for your expressed confidence in canning green beans using the bath method.. I just canned 14 jars worth, and used a lot of time. I read a recipe that suggested 15 minutes in boiling water for elevations above 10,000 feet. I live in Santa Fe NM and am hoping that my beans will be okay. How long will it be before the beans are pickled, and how long if they show themselves to be spoiled? How can I tell if they are spoiled since they are in vinegar which is a pungent smell to begin with. I’m hoping for the best. Thanks for your positivism! The person above who said 3 hours in boiling water makes me think that what will come out will be pure mush. But yes, what did folks do before pressure caners? I do remember the story about the fishermen who died at sea due to botulism during the war, but I also just spoke to a man who grew up with priests in the early 1900;s who used tin and soldered the cans shut, and miraculously, no one got sick. Yes! ha my sister used hot wax canning very interesting but its so much better to use the lids with the seals. Oh just a fyi to all you don’t have to keep buying rings either after the lids are sealed the bands/rings don’t have to stay on for storage.